The novel mechanism Active Ankle features three degrees of freedom that operate in an almost spherical manner. In comparison to spherical devices, its design offers advantages such as high stiffness, a simple and robust construction, and a good stress distribution. In the present paper, a comprehensive study of the design, analysis, and control of the Active Ankle in its almost-spherical work modality is provided. In particular, the kinematic analysis of the mechanism is conducted, solving the full inverse, the rotative inverse, and the forward kinematic problems. In addition, the manipulator’s workspace is characterized and the kinematic control, that has been implemented on a prototype of Active Ankle, is presented together with experimental results that demonstrate the employability as an ankle joint in a full body exoskeleton. 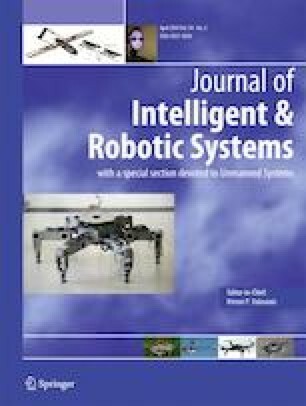 The work presented in this paper was performed within the project Recupera-Reha, funded by the German Aero-space Center (DLR) with federal funds from the Federal Ministry of Education and Research (BMBF) (Grant 01-IM-14006A). A set of reference configurations of the mechanism Active Ankle is displayed in Table 10.
the squared distance between a and b, and its generalization to vector sets, the Cayley–Menger bideterminants . The conversion methods mat2vec and vec2mat, called from Alg. 7 and Alg. 8, are stated in Alg. 12 and Alg. 13. Merlet, J.-P.: Parallel manipulators: state of the art and perspectives. In: Takamori, T., Tsuchiya, K. (eds.) Robotics, Mechatronics and Manufacturing Systems, pp. 21–26. Elsevier, Amsterdam. ISBN: 978-0-444-89700-8 (1993). https://doi.org/10.1016/B978-0-444-89700-8.50007-5, https://www.sciencedirect.com/science/article/pii/B9780444897008500075.